We offer both traditional Celestial Navigation (ASA 107) and the new Basic Celestial Navigation (ASA 117). Either one can be taken as a classroom course or independent study /correspondence. The Basic Celestial course provides students the basic knowledge needed to fix their position at sea when completely out of sight of land using the Sun and Polaris. There are no prerequisites for this class. Basic Celestial does not require students to learn and master the more cumbersome calculations required in ASA’s 107 level Celestial Navigation course. Students will get hands-on experience with the sextant and learn the fascinating concepts that make celestial navigation possible. We highly recommend this course not only as an important skill set for emergency navigation, but also as a fun learning exercise that will allow you to better understand everyday occurrences such as the changing length of the day throughout the year and why the sun never sets in the summer in most of Greenland. Course Fee: $299, including text materials. Optional Star Finder and sextants sold separately. Turn right onto Oxford St, Sailcrafters will be on the right. Independent Study Class / Correspondence. This course can also be completed by students who are remotely located. It usually requires some time spent with a navigation instructor by e-mail or telephone. Cost is $179 which includes the textbook. We like to interview prospective students in this category. Please call. In addition to the material covered in Basic Celestial Navigation, ASA 107 teaches students how to do sight reductions and navigate with the Sun, Moon, planets and stars in addition to Polaris. ASA 107 is a prerequisite for ASA-108, Offshore Passagemaking. This more advanced course covers how to find your position at sea plus other routine and special procedures for safe, efficient offshore navigation. No previous navigation experience is required and the only math involved is arithmetic. Currently offered only as correspondence course will conduct classroom class upon demand. Please express your interest by sending us a form. Independent Study Class / Correspondence. This course can be completed by students who are remotely located. It usually requires some time spent with a navigation instructor by e-mail or telephone. Cost is $259 which includes the Starpath materials (see below). We like to interview prospective students in this category. Please call. We recommend that you purchase a 2102-D Star Finder which goes with the Star Finder book that comes in the package. We offer the Weems & Plath Star Finder listed below. 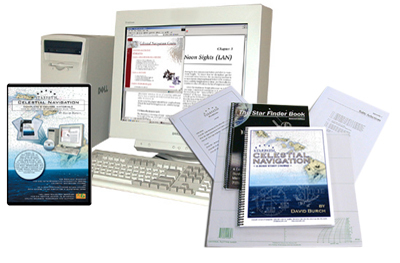 The Starpath Celestial Navigation Home Study Course includes a total paper course package as well as a comprehensive electronic version of the entire course as a download. With this combination you can choose the media that is most convenient to you at the time. Use the search engines and software resources from the computer and use the printed texts for study away from a computer. Note: Software requires Windows operating system. Available for purchase: Navigation instruments by Weems & Plath. Ultra light 7" dividers: $17.00. *Both instruments are ideal for chart books. Call Northern Breezes Sailing School at 763-542-9707 to register or with questions. None per ASA, although we recommend taking Coastal Navigation (ASA 105) prior to enrolling in Celestial Navigation.